I pick this word sojourner and it sounds good to me. Some days it feels too spiritual, some days I want to laugh at just how perfectly it describes my life. I’m never home. Always pitching a tent somewhere, never completely settled. I am a sojourner. This is who I am. But sometimes, I am so very reluctant. Reluctant to play the roles given to me—wife, mother, friend. Reluctant to seek the Kingdom first. Reluctant to bow my head in humility. Reluctant to get too comfortable. Reluctant toward pain. Reluctant, this week, to Mother’s Day. I hear the strings of the old hymn, Come Thou Fount of Every Blessing, and every time without fail it stirs me. I know I am the wanderer. I am the one who leaves. I am the one promised with a forever betrothal. I am Gomer, the unfaithful Israel—the forgetful, the hesitant, the reluctant sojourner. I am the Redeemed, the Bought, the Paid For. I am the Chosen One, the Royal Priesthood, the Bride. And still I forget, because I am reluctant. I am still on my journey home. 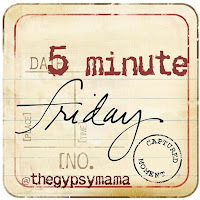 It’s been awhile, but today I’m joining with 5 Minute Friday hosted by The Gypsy Mama. Just write for 5 minutes, unhindered. Today’s prompt is identity. Such beautiful words. I have always loved that hymn. So nice to meet you. Beautiful, Jess. Just beautiful. Thank you for being so honest. I too am reluctant in so many ways. Wandering. Wondering. But staying on the journey. oh the wandering… so tired of the wandering some times!! Thank you for your words.